1 drawing on paper ; 8 x 10.75 in. 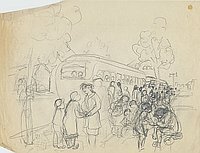 Pencil drawing of the forced removal of Japanese Americans by bus in residential area during World War II, United States. Two buses wait on tree-lined street as people gather on sidewalks to board buses. Heads of people visible in windows. 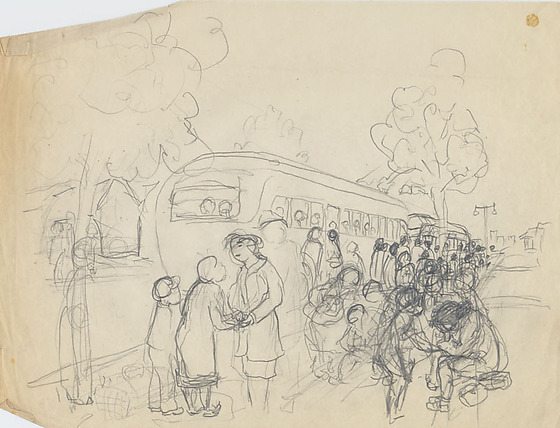 In foreground, roughly drawn image of a person seated on ground, right, as two other people comfort her; a woman in a suit and hat holds the hands of an older woman, left, as a boy in cap stands by at left. City skyline visible in distance.